I recently travelled from Western Australia to Adelaide to experience the inaugural Festival of Contemporary Aboriginal and Torres Strait Islander Art showcasing and celebrating Indigenous culture – Tarnanthi 2015. Whilst the visual arts dominated the festival scape, it is the incredible power of storytelling woven throughout the many creations and Tarnanthi that resonated with me. In this edition of FNAWN I share some insights from Ali Cobby Eckermann and on the Kapi Ungupayi/He gave us Water exhibition. I was particularly pleased to reconnect and spend some time with South Australian poet, writer and sculptor Ali Cobby Eckermann. 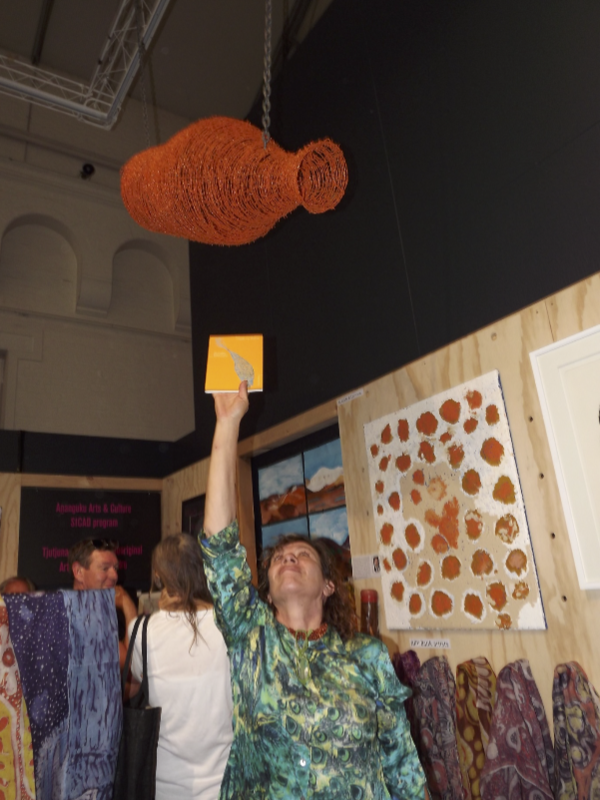 Ali was involved in several Tarnanthi events – the Aboriginal Arts Fair held at Tandanya, Our Mob 2015 exhibition and writing response poetry to artist Yhonnie Scarce’s glass installation “Thunder raining poison” in the Art Gallery of South Australia. In conversation we spoke of the place of writers and their books at these types of Festivals and Art Fairs, her inspirations behind creating the wire sculptures and writing a poetic response to Yhonnie Scarces installation. “I was invited to the Aboriginal Arts Fair by Nici Cumpston who encouraged all art forms to be present. The quality of all artists including all writers allowed me to place my books at the Arts Fair which was an opportunity to promote and discuss and allowed sales. I was asked if I had a Certificate of Authenticity to explain the background of my sculpture and I said “No I have a book which does the same thing”. I really felt that people at the Arts Market liked the combination of the art, literature and poetry. Most people would not have the money to buy the sculpture but 90% of people brought a book”. I would like to sincerely thank Ali for sharing for our FNAWN Newsletter. On my last day in Adelaide I got a phone call from my AACHWA colleague saying “you better get down here Charmaine you will just love this exhibition”. When I walked into the SASA Gallery I was overwhelmed by what greeted me, and in a really good way. The exhibition was about the journey of five women in remote Western Australia (Blackstone and Wingellina), represented by the five tiny grass woven women figures greeting me at the entry point into the Gallery. One of the exhibition curators kindly spoke with me about the inspiration behind the exhibition and the stories woven into each exhibition element from the painted Toyota panel to the Sorry Business Camp stitched blankets. The story tellers were five desert women who had gone out bush to gather punu (wood) for carving and their Toyota ran out of petrol stranding them for five days out in the desert. The women had to draw upon the cultural teachings and traditional knowledge handed down to them to find water and food to survive. The women describe this journey as the creation of a new tjukurpa (dreaming story), and every element of this new tjukurpa was present in the exhibition. They survived on goanna for food – there were grass woven standing goanna’s. They recalled being told stories of how finch birds would gather where there was water (holy water), they followed the finch birds, dug for water and found the holy water – there were finch bird paintings and an installation with hand woven finch birds gathering for water. 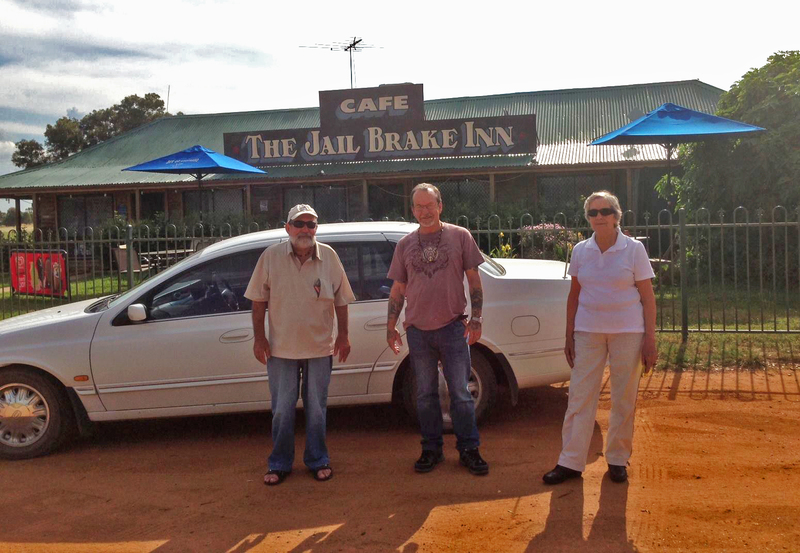 A panel from the Toyota they drove into the bush was painted and exhibited – the vehicle part of this new dreaming story. Their traditional knowledge and stories handed down gave hope as the women sung songs in their country and to their country – a powerful video presentation was beautiful with calming sounds of singing flowing throughout SASA Gallery. A busy time for FNAWN Director Ken Canning and former Director Barbara Nicholson. Dub Leffler, illustrator and FNAWN member, reflects on the recent FNAWN delegation to the United States. It was an absolute honour to be included in the first FNAWN delegation to go to the United States. The logistics of such a journey was not an easy task – something I have to thank the combined team behind the scenes from FNAWN led by Tony Duke and Cathy Craigie for organising & delivering. The delegation itself showed a broad range of the what we do as writers – from informed works Science & Agriculture, Young Adult novels of faction and meta fiction to Picture books & University papers,prose & poem. The opportunities we were afforded were defining highlights in my career to date – being welcomed at The Australian Embassy, featuring at The National Book Festival in Washington Dc, attending gala dinners with America’s literati, visiting the Kluge Ruhe Australian Aboriginal Art Gallery, meeting with The Author’s Guild to reading work at the prestigious Poets House in New York – all were highlights and vital to expanding our literature into international markets. We were made most welcome by all parties involved and was amazed at the burgeoning interest in our culture & work -something i’m sure will continue. Tours like this, reinforce the feeling that the writings of our culture, history & future are important and a welcome part of the global village. 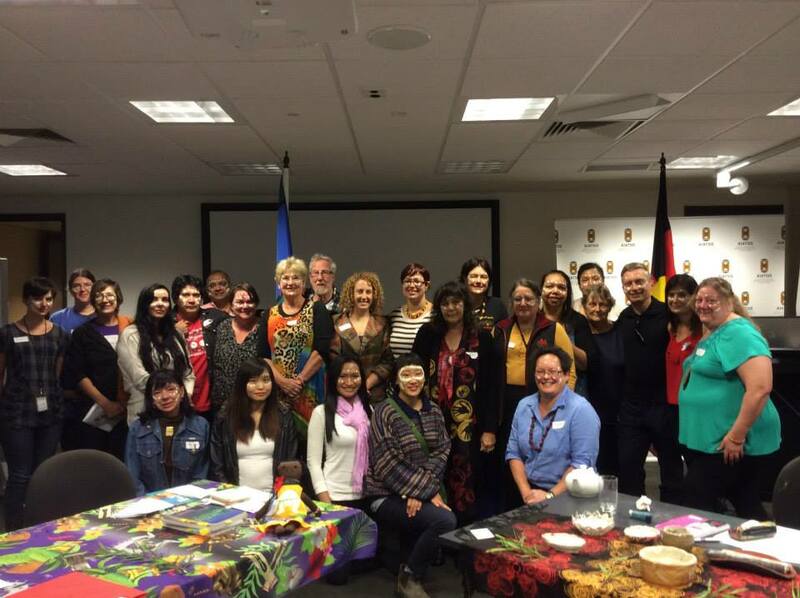 On Friday 10 July, Kerry Reed-Gilbert (FNAWN Chairperson) and Samantha Faulkner (Us Mob Writing) joined staff at the Department of Health to celebrate NAIDOC Week. This was the third NAIDOC Week event that the Department of Health, based at Woden, held. Kerry and Samantha both read their work from By Close of Business and other publications. They shared their personal perspectives, experiences and background to the poems and engaged in discussion with the audience. One of the staff members also shared his poetry which was well received by the small and intimate audience. Copies of By Close of Business were also given to the Department’s staff who expressed interest in doing something similar in the near future. The poetry reading was a great way to finish NAIDOC Week and was appreciated by Indigenous and non-Indigenous staff. In the autumn of 2014 Yankunytjatjara poet Ali Cobby Eckermann was the first Aboriginal Australian writer to attend the prestigious International Writing Program in the USA. The program is run by the University of Iowa located in Iowa City, and was a 3 month residency spent with 28 other writers from 28 countries from around the world. The onus of the residency is flexible, although there was much opportunity to listen to and interact with the other writers at various lectures and readings. Social invitations were extended by generous Iowan personalities, and the IWP staff arranged free trips to iconic American sites eg the Effify Mounds ancient burial grounds and national park. For Ali the main benefit of the residency was the friendships she made with the other writers, sharing conversations of story and the influence of genre. Many of the writers live in war torn countries, and their poetry was captivating. During the residency Ali travelled to participate in the City of Asylum Jazz Poetry Concert in Pittsburgh Pennsylvania, New Orleans and Chicago, gave a lecture at the University of Denver and spent a day in the Rocky Mountains, delivered a 3 hour workshop at the Diagnostic & Correctional Prison south of St Louis in Missouri, toured Washington DC, and read at the Poets House in New York City. Whilst in America Ali’s award winning verse novel Ruby Moonlight was published in the US by Flood Editions in Chicago. Ali is looking forward to her return to America in 2016, to attend a forum between contemporary Australian poets and activist American poets in the San Francisco area, to be held at the University of California, Berkeley. Next month Ali will be guest Distance Learning facilitator for the IWP Narrative Witness Indigenous Peoples: Australia-America exchange. Ali will share this role with Cree poet Jennifer Foerster. The IWP is currently recruiting Aboriginal persons who are interested in this exchange using both the mediums of literature and photography. – Rosalie-Kunoth Monks – Elder and Northern Territory Australian of the Year. Many Australians are still waiting for the outcry over the suspension of the Race Discrimination Act which allowed this legislation to pass, not once, but twice. In 2012, the Intervention was renamed “Stronger Futures” and designed to impinge further on the human rights of those in remote communities for another decade. Award-winning and internationally recognised Indigenous and non-Indigenous Australian authors and commentators have taken a stand the best way they can, by using the power of their writing to generate much needed discussion and debate – in homes, universities and in work places. Edited by Rosie Scott and Anita Heiss, the Intervention Anthology includes statements by Elders, poetry, commentary, fiction and non-fiction as a means of reaching out and speaking to as many Australians as possible. “A powerful collection of views from Aboriginal Elders, experts, lawyers and some of the nation’s finest writers. And an indispensable contribution to the urgent question of the wellbeing and dignity of Aboriginal Australians. As Rosalie Kunoth-Monks puts it ‘We are your people and you are our people.’ We can’t not listen to each other,’ said Anna Funder, an international award winning author. 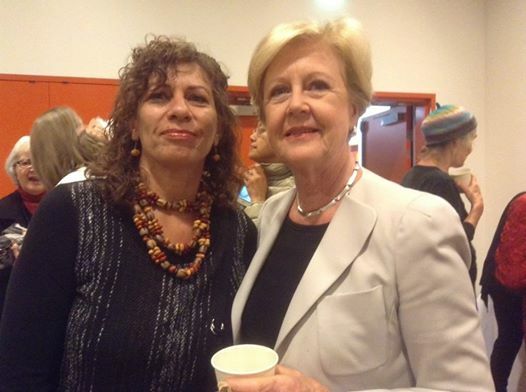 The Intervention: an anthology will be launched by Gillian Triggs in Sydney on 1 July at the National Centre of Indigenous Excellence in Redfern. Other events include: 9 July at Ashfield Town Hall; 4 August at Charles Darwin University. Events are also being planned in Newcastle, Melbourne and other locations. The Intervention will be available to purchase online from Booktopia. This project would not have been possible without the support from WITA (Women Inspired to Action) for crowdfunding, ‘concerned Australians’, the Copyright Agency Cultural Fund, and extensive in-kind support from Curtis Brown, Kirby Brown and Booktopia. Yimbama is available from Vagabond Press. Us Mob Writers (UMW) recently participated in Canberra’s first ever experimental writing festival, Noted held from 20-22 March. 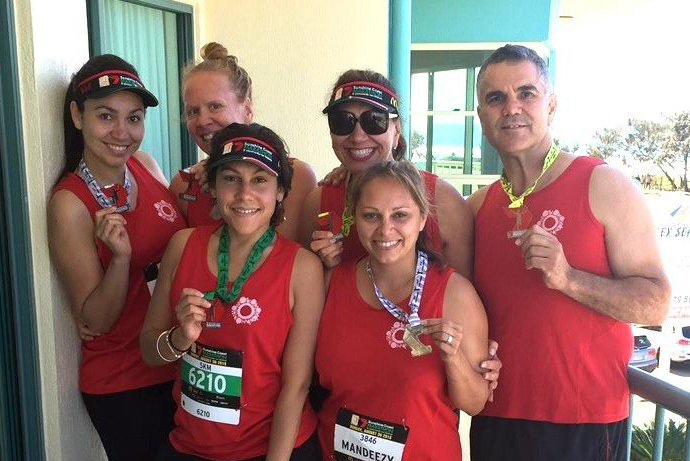 UMW held a workshop session on Sunday 22 March in the Mabo Room at the Australian Institute of Aboriginal and Torres Strait Islander Studies (AIATSIS). The workshop – Where the Deadly Words Are: Us Mob, began with an ochre ceremony by Kerry Reed-Gilbert. UMW members also participating included: Lisa Fuller, Michelle Bedford, Samia Goudie, Jeanine Leane, Marissa McDowell, Joyce Graham and Samantha Faulkner. About 50 people attended and participated in writing exercises, sharing their poetry and listening to readings from By Close of Business by UMW. Thanks go to Russell Taylor, Principal of AIATSIS for providing the venue and Rita Metzenrath for her assistance with the workshop. Dr Jeanine Leane also spoke during Noted Festival on Indigenous Literature Today. Jim Everett and Kim Scott were guests at the Vancouver Arts Centre, Albany, Western Australia last month. Here is Jim’s round-up of their very busy and wonderfully engaging time. Kim and Jim interviewed by local author Sarah Drummond at the Vancouver Arts Centre, Albany. This was an interesting interview where Kim’s background differed from Jim’s, and the discussions covered writing to politics, to family history and Country. Questions were taken and the ensuing discussions could have gone on for some time if not for the time limit for others to take the room. Kim and Jim held a 2 hour workshop with students from 4 schools – 19 participating students and their 4 teachers/carers. Kim has a teacher’s experience and led the workshops, which worked very well. The students were very attentive and showed great interest. We all enjoyed this first day of short story writing, and sharing stories written by students. 2 hour workshop – Kim led the workshops again, with Jim taking a role with writing exercises. The students came with some ‘homework’ for the workshop exercises of the day. Included music and song writing as a means of introducing a form of creative writing. Other writing exercises were undertaken on poetry, and discussions on ‘why write’, and ‘finding ways’ to write, ‘triggers’, and family characters etc. The students were well pleased with the workshops, and said they wanted more, and longer workshops set on Country, and camps. I can say that we all enjoyed the experience of writing in a workshop, and that the whole event was well worth doing.